M3rNi3: It's Here! .. THE PACKAGE that is! I came back from work yesterday and a package greeted me at home. 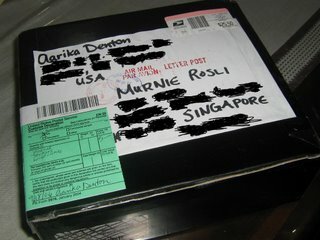 This aint any ordinary package (hmm I've never received any, anyway .. hehe). This is THE BBM PACKAGE from my swap partner, Aarika Denton, from USA. 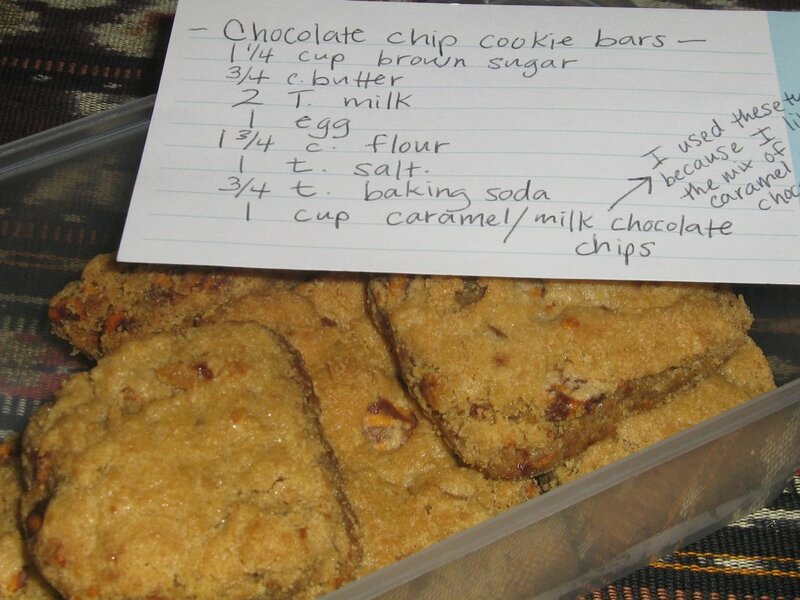 With my handbag still slung on my shoulder, I took out my camera and snapped a picture, then went straight into the kitchen, grabbed a knife and knife the package open. It was a real sweet surprise! 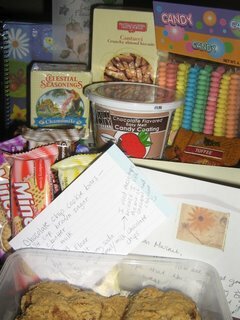 Right on top of all the goodies was a letter in an envelope written by Aarika herself. So I read that first before slowly going thru the box of nice stuff. First there was Chamomile Tea. I know of its soothing effect but have never tried any .. so there's every reason for me to try now! There's also a box of Crunchy Almond Biscuits .. hmm .. wat a coincident coz jus before I got home, I went to the supermart and almost bought a box of amaretti but then decided not to .. this makes a great substitute. Aarika really did her homework well. She read my blog and found out that I have 2 angels and she included in the package Candy Necklaces. Really sweet of you Aarika. 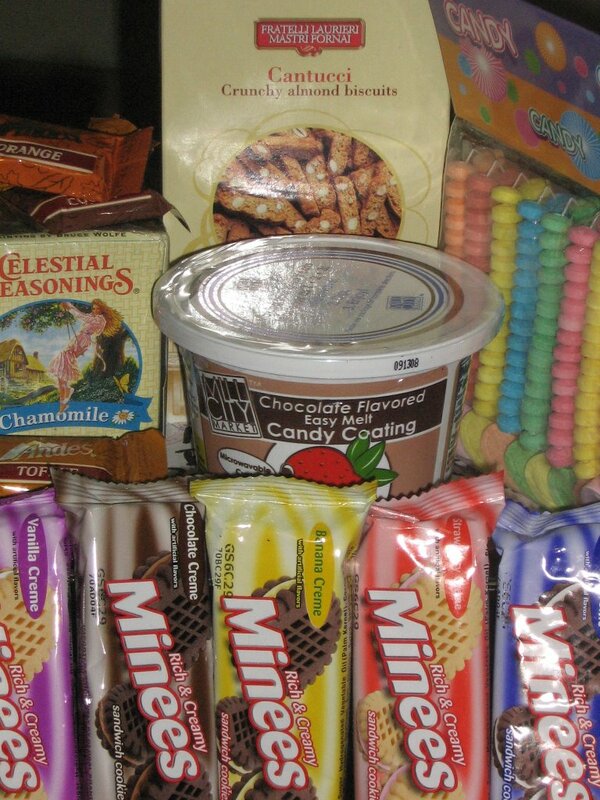 My angels have yet to see these .. i am sure they will go crazy over these candies. 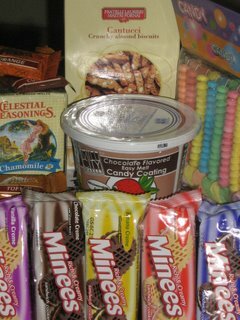 Andes Chocs were also in there .. toffee, orange, cocoa .. they didnt last long .. i esp. love the toffee ones. That's not all folks, Aarika also included these .. 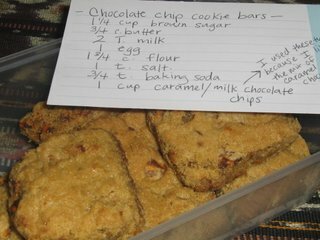 Her very own, Caramel/Choc Chip Bars + Recipe Card. These are oooohh so chocalatey rich .. really yummy. I wish I could find caramel chips here in Singapore. If you think thats the end. Well you are wrong. She included a pretty Journal and beautiful Stickers too. Terima kasih (dats thank you in malay language) Aarika of Aarikavination for all the goodies and your generosity. My thanks too to Steph of Dispensing Happiness. Congrats on a job well done! I wonder when is the next BBM?? .. I cant wait to participate again! Yay! I'm so glad you got the package. 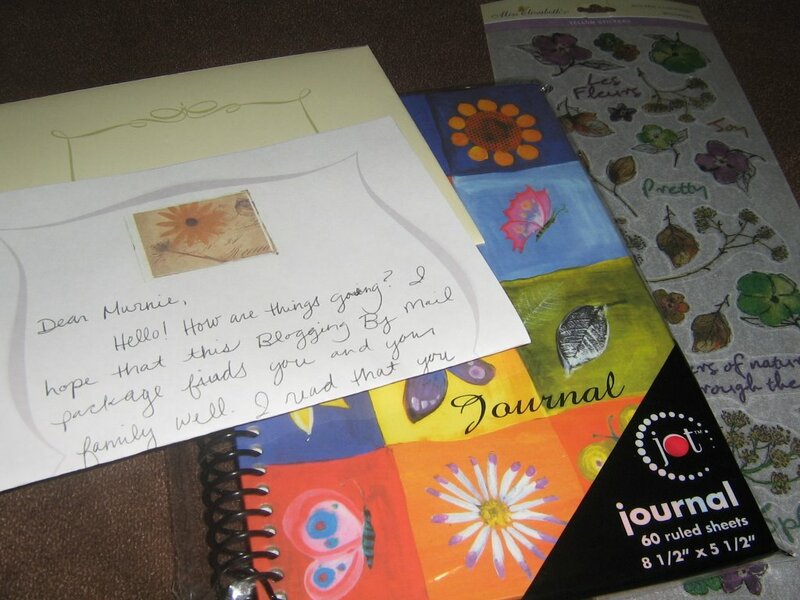 Blogging By Mail is pretty much the best invention ever =) Enjoy! i couldnt agree with you more. BBM is the greatest idea one could have come up with! i have already tried some of the goodies (there are some which i've yet to try) .. i felt that i just hv to keep them a lil longer .. hahah .. crazy me ..
ok Im so jealous right now... I want to join BBM!!!!! M3rni3 please inform me when the next one coming up k? And tell me how to join sounds so much fun and you got toffee...I love toffee arrgghh so jealous so jealous...hmmpphh! Thanks for popping over my blog. I will definitely inform you once I know when is the next one .. dis is really kewl stuff.